Betula Alba. Its appearance in summer is elegant, and in winter the bark is frequently variegated with red and white streaks. It is a tall straight tree, with many boughs, and slender branches bending downward; the old being covered with a discoloured chapped bark, and the younger being much browner. The leaves are dented about the edges. It bears small short catskins, somewhat like those of the hazlenut-tree, which growing ripe, fall on the ground, and their seed with them. It usually grows in woods. The juice of the leaves, while young, or the distilled water of them, or the juice from the tree bored with an augur, and distilled afterwards, any of these being drunk for some days together, tends to break the stone in the kidneys and bladder, and is good also to wash sore mouths. The leaves have been used in the itch, dropsy, etcetera, either externally applied, or taken in decoction. 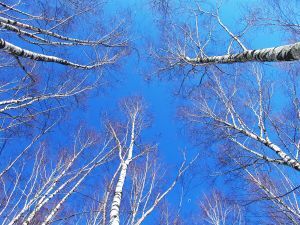 Birch-wine made from the juice of the tree, is an excellent remedy for consumptions, and scurvy; and the fungus which grows on the tree, is a good styptic.